Our analysis methods for multivariate weather data have been implemented into the QUantitative Estimation of Space-Time processes in volumetric data for Weather (QUEST-WX) software application. 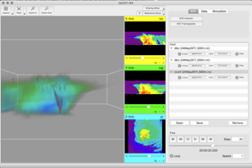 QUEST-WX is our weather analysis module for use with both MDR and large-scale storm simulation data, incorporating our EFD analysis and EFD tractography modules along with advanced visualization tools for multivariate time-based weather data. We have now also incorporated the JESTER method into the analysis pathway, allowing multiple meteorological parameters to be estimated jointly.